Gruuv returns with a four-track EP today, Lau Frank’s ‘Body Count’ backed with remixes from Dachshund and Tiger Stripes. Buenos Aires, Argentina’s Laurenalo Augusto Nicolas aka Lau Frank has been releasing material since 2011 and in recent years has unveiled output for Cubism Records and the ‘Mood Indigo’ EP for Kolour Recordings, positioning him alongside the likes of Mano Le Tough, KiNK and Soul Minority on the roster. Lau Frank’s ‘Warehouse Fire’ released on Bosom in 2014 brought the young Argentinean to the attention of Audiojack, label-heads of Gruuv, the track not only became a mainstay in their DJ box but was also a perfect example of the musical direction in which they were moving both with their sets and the label. 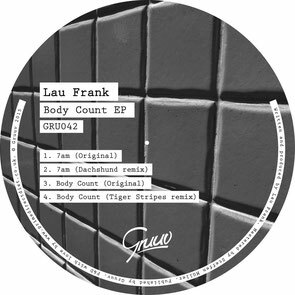 When they approached him to make an EP for Gruuv, Lau was equally enthused to be involved and got to work right away resulting in the ‘Body Count’ EP. Kicking things off is ‘7am’ which sees Lau provide a smooth opening cut, bringing soft chords, organic percussive rolls and bulbous sub tones into the limelight over its eight and a half minute duration. Swiss house’s Dachshund delivers his take on ‘7am’ to follow and ups the energy levels with vacillating bass, shuffling snares and ghostly background atmospherics. On the flip is title cut ‘Body Count’ a murky, brooding composition led by swirling pads, snaking bass tones and low pitched vocal murmurs. Tiger Stripes to the label to round things off with his interpretation offering up a dub-infused workout to complete the release.